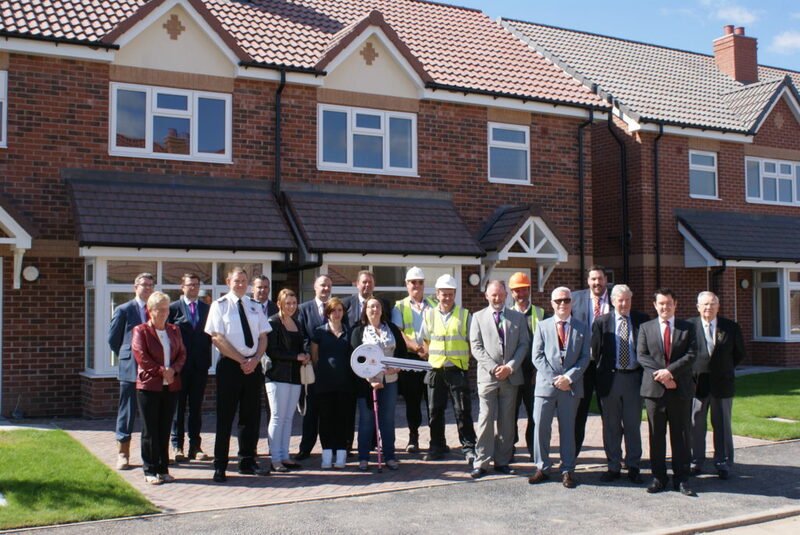 The first phase of a £5.7m council house building programme in Bassetlaw has been unveiled by construction company Woodhead. The three-year project for A1 Housing and Bassetlaw District Council has already seen 19 properties built on a former recreation field at Smith Square in Harworth. In total, 71 new homes will be constructed on Smith Square and Thompson Avenue to replace the outdated ‘Airey’ homes – a pre-fabricated house built after WWII. The development includes a mix of two, three and four-bedroom houses, two-bedroom semi-detached bungalows and flats. All new homes have been fitted with energy saving and safety measures such as solar panels and a smoke alarm and sprinkler system. The energy efficient properties will all be built to Code for Sustainable Homes Level 4, reducing tenants’ fuel bills and providing comfortable spaces for families and individuals. Glenn Slater, Business Development Director at Woodhead, said: “This three year programme has not only enabled us to deliver high quality social housing in Harworth, but we’ve also been able to commit to providing added social value for the local community. “During this first year on site we have hosted 21 work experience placements, engaged with 300 students and created two full-time employment opportunities for people living within a few hundred yards of the site. The project, which was procured through procurement consortium, Efficiency East Midlands (EEM) will be completed over three phases, with an initial budget of £5.7m, including £1.02m Government funding, for the first two phases. HCA funding of £686,000 is also to be confirmed for phase three of the project. Don Spittlehouse, Managing Director at A1 Housing, said: “From the tender stage to the completion of the first phase, this has been a really exciting project with major contributions from a number of different partners. Work has already begun on Phase Two, which will see the remaining eight ‘Airey’ houses on Smith Square demolished to make way for 24 new properties. Once complete, the remaining residents of Common Lane and Styrrup Road will move into the new properties. Phase Three will see the remaining ‘Airey’ houses on Thompson Avenue demolished and a further 28 new properties developed on the site. Sarah Cartlidge, one of the first A1 Housing tenants to move onto the new street said: “When we were told that they were knocking down the old Airey Houses and we were going to be given brand new properties, we didn’t believe it.